Premium grade Extra soft white hand towels for use in Salons, Gyms, Spas, Hotels and many more businesses. If you are looking for a medium size hand towel this will be the product to go with. No towel receives a workout quite like a white hand towel does. On a daily basis, they’re met with the challenge of fulfilling all of your toweling needs. From mopping up messes to freshening up your face after a cardio session at the gym, there is no shortage of tasks towels confront each day. With so many uses, you need a towel that can meet your everyday demands while exceeding your expectations. Nobody wants a frayed, non-absorbent towel to clean up messes. You want a quick-wicking towel that can withstand constant washing and emerge from the dryer fresh and ready for the next use. Does this sound like the right towel for you? Shopping at Towel Super Center provides you with the type of quality you and your business need. Gyms: Your clients work hard, and their towels should, too. While at the gym, sweating is not only inevitable, but it’s a necessary result of any great workout. Our wholesale white hand towels are made from 100% cotton fibers, which means moisture is quickly wiped up without leaving a soggy or damp feeling behind. With compact measurements, our premium white hand towels are the perfect addition to any locker room, front entrance or gym counter top where clients can easily pick up a cloth to keep up with them during their workout. Barbershops and hair salons: Our line of premium white hand towels are made in convenient 16” X 27” proportions that make them an excellent fit to cushion your clients’ heads with when they’re leaning against shampoo and rinsing bowls. For those patrons who skip the lathering and go straight for the cut, these hand towels are the perfect addition to a barber’s countertop where clients can easily reach for a freshly laundered smooth cloth to wipe off remaining hairs. Tanning salons: Throughout the day, you use an endless array of towels to wipe up spills, spruce up countertops and dry off your hands after cleaning up all of the day’s messes. Our premium white hand towels are versatile enough to handle tough spills while also providing smooth fluffy softness for clients’ skin and hands when drying up after washing. No matter what company or industry you work in, there is never a moment where you’ll find you won’t need drying materials throughout the day. 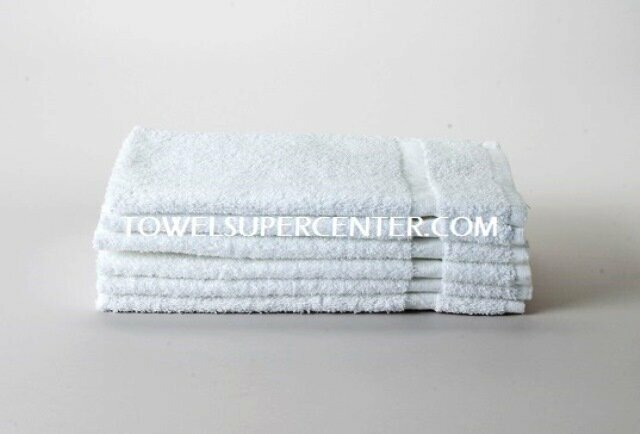 Fulfill your order with Towel Super Center to ensure your company gets the towels it deserves at a great value.